Make no mistake: Amazon is coming for your industry; the complete guide to artificial intelligence; autonomous vehicles are perfect for collecting data (especially by law enforcement); the Auto:Motive 20/20 e-book; the case against buyer personas; the most trusted companies; leadership lessons galore; Walmart's reputation is immune from bad news; more tech is coming to e-commerce; Facebook is getting more aggressive; keep your eye on MoviePass; Equifax is getting off; ride-hailing companies don't want you to own autonomous vehicles; predictions for data and analytics; find out how moral you are; and more in the Amazon For ___ edition of The Full Monty from Brain+Trust Partners for the week of February 5, 2018. We're going to be making some slight changes to the newsletter in the near future, and we'll be asking for your feedback to ensure that we're not doing so in a vacuum. Please stay tuned. Jeff Bezos is now the richest man in the world. And he's not only the richest in terms of financial holdings, but in terms of data, market share and mind share. Amazon has ruined virtually every customer experience for us, because whether or not Amazon plays in a particular market, the very experience of using their service has elevated what shopping should be. With more than 64 percent of U.S. households participating in Amazon Prime, we want our goods and we want them now. And we want more complex transactions such as healthcare and car buying to match those experiences. While car dealers will always fall back on the weak excuse of franchise laws, they're already in a precarious spot, with low trust and favorability from consumers; if Amazon did a head-fake in the automotive direction, you can bet that markets would be rattled. And so it was last week in healthcare, when Amazon, along with Warren Buffet's Berkshire Hathaway and JPMorgan Chase announced a collective whereby the three companies would address healthcare challenges and develop a more cost-effective system for their employees. And as you would expect, the healthcare market was spooked, and stocks dropped. All it takes is a head-fake from Amazon and market cap gets erased in an instant. It doesn't matter what industry you're in; Amazon wants to be there — or at least has the potential to be there. You know that little arrow that makes up Amazon's logo? That's not just a smile. It points from A to Z. And you can bet Amazon is going to get there. Amazon, Berkshire Hathaway and JPMorgan Chase are joining forces to address issues in healthcare for their three companies. The initial focus, they said, will be on "technology solutions that will provide U.S. employees and their families with simplified, high-quality and transparent health care at a reasonable cost." The move erased $30 billion in market value for healthcare’s biggest companies. Such is the power of Amazon. Smart algorithms aren't taking all the jobs, but they are doing some remarkable things. Here's Wired's Complete Guide to Artificial Intelligence. From its origins in 1956 to the latest advances in health technology, it's an excellent overview of where we are. It's also refreshing to see them admit that A.I. is overhyped. Relatively few businesses have the skill or money to take full advantage of the capabilities in A.I. and machine learning, and Google is taking another step in addressing this gap by making machine learning more mainstream. A new update to Google Flights will use machine-learning algorithms to predict delays before the information is available from the airlines. If you haven't used it yet, here are seven ways that Google Flights beats other travel search sites. You'll agree. Machines aren't the answer, and as they continue to be inserted into processes, it's not about replacing humans. As with any technological advance, there's going to be a pendulum swing, and Chris Penn has an idea of a hybrid approach as the Human Backlash Against A.I. Is Coming. Autonomous vehicles will be perfection itself for law enforcement: the data will serve as something of an "instant replay" for what occurred in incidents. One would expect insurance companies will also benefit (assuming insurance as we know it survives the autonomous age). All of those electric semis that Tesla is building? The customers will be responsible for developing charging solutions initially. According to the California Department of Motor Vehicles, Waymo and GM/Cruise have logged the most miles in autonomous testing in the state, accounting for approximately 96 percent of all autonomous miles. There's a virtual pile-up for the remaining 4 percent. Former Google engineers have raised $92 million to roll out autonomous delivery vehicles this year. That's right. Autonomous delivery vehicles may be here sooner than fully autonomous passenger vehicles. 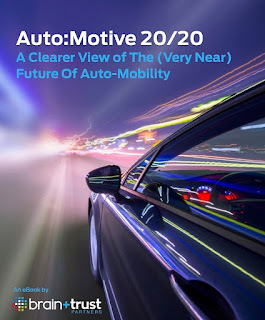 Brain+Trust Partners recently debuted the publication of Auto:Motive 20/20, a look at what's moving the future of the car industry. Did you miss it? There's still time to download it. 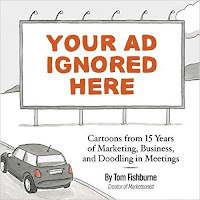 In light of the Super Bowl ads that are the talk of the industry, here's a must-read from Tom Fishburne. Your Ad Ignored Here is a compilation of some of his best work from marketoonist.com. It's 2018. Why are we still using buyer personas? Making the case against buyer personas. You've likely seen those happy/sad button customer experience terminals that ask you to rate your experience. While it may seem as if they don't provide much directional input, the fact is, the information they gather is quite revealing. In Amazon's 4th quarter earnings, there was one figure that stood out: its ad business grew by 60 percent. Look out, Google and Facebook (and everyone else). How does Walmart's reputation play into customer loyalty? It turns out that bad news doesn't have much of an effect on shoppers; many value a company’s “social consciousness and overall kindness” instead. Sam Maule interviewed Brain+Trust Partners' CEO Scott Monty on Connection Interrupted to talk about lessons in leadership — from his experience with former Ford CEO Alan Mulally and what he learned from three of the best interviewers in history. Want the secret to good leadership? It starts with one thing. As The Bon-Ton — a 120 year-old company — files for Chapter 11 bankruptcy, they offer a lesson in the dangers of only focusing on in-store experience — especially with a market segment that values online experiences. Meanwhile, Amazon is leaving breadcrumbs for any retailer to follow with Amazon Go. Amazon's priorities for 2018: way more than commerce. A survey of e-commerce professionals worldwide — representing agencies and brand marketers — found respondents plan to test a diverse range of technologies within the next two years, although some of their goals differ. Chatbots and virtual assistants are a top future priority. Twitter is becoming a more valuable tool for the news business as Facebook overhauls its feed. Facebook is now sending just 2.5 visitors to publishers’ sites for every one visitor Twitter sends. The social network is getting aggressive with people who don’t log in often, working to keep up its engagement numbers. The company is also promising to push more local news stories into your feed. Speaking of feed, the New Feed's days may be numbered. Also numbered: the days of the Instagram influencer, as changes take place to make Instagram more pay-for-play. Fiction is out-performing reality: an ex-YouTube insider reveals how its recommendation algorithm promotes divisive clips and conspiracy videos. YouTube and Facebook is where U.S. social media users head to watch video, according to a recent survey. Duh. MoviePass continues to heat up and goes to battle with AMC. Is the at-home feature film service here to stay? How does MoviePass make money? Perhaps as with Amazon, it's all about amassing regular customers first. The $220 million podcast industry is poised to significantly expand as Hollywood offers lucrative new revenue opportunities. Gimlet Media is creating Gimlet Pictures to capitalize on the opportunity. The new measurement platform from Apple Podcasts is showing that podcast listeners are faithful and attentive — exactly the kind of attributes advertisers want in an audience. Program of the Week: Since conspiracy theories seem to have dominated last week's news cycles, we give you The Polybius Conspiracy from Radiotopia, a complex story of two men united by a decades-old urban legend. Polybius, a mysterious arcade game from the '80s whose alleged existence in the Pacific Northwest is fueled by myth and an obsessive online fan base. Do you have a program to recommend? Add yours to our Google Sheet: smonty.co/yourpodcasts. The head of the Consumer Financial Protection Bureau is tabling the investigation of Equifax over its enormous data breach that endangered hundreds of millions of consumers. So much for "protection." Privacy matters to consumers. That's why these retailers are taking customer data privacy seriously. A number of ride-hailing companies (such as Uber, Lyft, Zipcar, Didi Chuxing and others) are banding together to require that autonomous vehicles belong only to fleets, not to individual drivers. How's that for cornering the market? Uber is partnering with JUMP to begin piloting a bike-sharing service called Uber Bike in San Francisco starting next week. Airbnb has lost its CFO and will not go public in 2018. Sleep on it. The honeymoon for A.I. is over; here are 10 predictions for A.I., big data, and analytics this year, from conversational interfaces to real-time recommendations, a breakdown between structured and unstructured data and more. Data and analytics play a critical role in innovation and startup success. Good data scientists are like unicorns. So make life easier for your newly-hired data scientist. From the world of practical ethics: times are challenging, philosophy can make your head hurt, and no one likes quizzes. Put them all together and you get this quiz to test how moral (or immoral) you are, or the Oxford Utilitarian Scale. If you use the Chrome browser, here are some Chrome extensions that some people can't live without. You may not realize it, but your resume may be giving off subtle class cues. Top image credit: The Miriam and Ira D. Wallach Division of Art, Prints and Photographs: Print Collection, The New York Public Library. "View of Seattle, looking toward Puget Sound." The New York Public Library Digital Collections. 1874.